I'm illustrator and an award winning comic artist currently residing in Los Angeles. I'm passionate about creating sequential artwork that illustrate the kinds of relationships people have throughout life, whether it be with each other, nature, or the unknown. I was born and raised in Southern California, spending most of my life in San Diego. While I love San Diego's natural beauty, I made the move to Los Angeles to learn from the masters of the entertainment industry. I'm very proud to have earned a BFA in Illustration from California State University, Fullerton. Currently, I am spending most of my time working on Hashtag Comic's new series Cloud Riders, as well as my online graphic novel, Suihira: The City of Water. 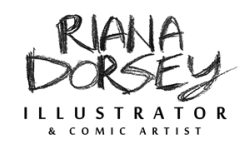 feel free to email me at riana (dot) dorsey (at) gmail (dot) com!